Red Nation International Film Festival & RNCI Red Nation Awards This year, marks the 23rd RNCI season in showcasing features, documentaries, shorts, film market that are produced from the heart of Indian Country USA and International Indigenous Nations, produced by emerging and established American Indian filmmakers. Red Nation International Film Festival features the only film competition in the world that offers guaranteed distribution of American Indian & Indigenous Award winning independent films, as well as films that screen at the festival to include a broadcast television release in partnership with Red Nation Television Network™, a global provider of streaming movies and TV series and soon to be announced Festival’s native films televised on a Cable server provider. The festival will kick off November 5, 2018 at USC. Festival runs November 5 thru 16. RNCI Red Nation Awards Show on November 16 at Laemmle Ahrya Fine Arts Theatre Beverly Hills CA. Throughout the 12 days, the festivals diverse audience, made up of the public, journalists, educators, visiting filmmakers, A-list celebs, film distribution companies, will experience American Indian Cinema, with a lineup over 57 Films. 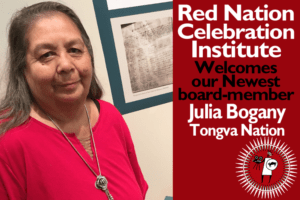 American Indian & Indigenous cinema, with many screenings followed by Red Nation Conversation Series Q & A sessions with directors, producers and cast. Festival includes Red Nation Conversation Series Forum: Environment-Social Justice-Films, Native FILM Market – Distribution-The Pitch, Two Spirit Film Series, Native Youth Matter Film Series, Indigenous Film Series, Environment Films – Native Allies, Retrospective Honoring Filmmakers, Native Women in Film & Television Films Directed by Women. Red Nation International Film Festival – The Authentic Voice of American Indian & Indigenous Cinema™ is the world’s longest running exposition of films by and about Native people in Los Angeles – The Heart of the Entertainment Industry. The festival has served and celebrated 23 years of American Indian & Indigenous Filmmakers, performing artists, audiences, as well as build on partnerships with Network Corporations, Studios, Tribal Communities, American Indian owned Businesses, Public and Private Foundations, Production Companies, and Corporate Sponsors, all of which are based on integrity and their passion to keep our mission alive and thriving. Our trusted partners have become our family of the Festival audiences and patrons. Red Nation International Film Festival™, RNCI Red Nation Awards™, Native FILM Market™ and its programs are supported by American Indian communities, Corporate America, City Government Funding, Private Foundations, Individuals and the Music and Film Industries who share important social and philanthropic values. The Festival, RNCI Red Nation Awards, Red Nation Television Network-Native is Here (RNTV), is all about #PowerOfInclusion and has become the trustworthy content provider with its groundbreaking initiatives. 2016, RNCI Red Nation Awards was broadcast LIVE for the fourth consecutive year, marking yet another histortic phenomenon. In 2014, RNCI Red Nation Awards Show made history in broadcasting LIVE. 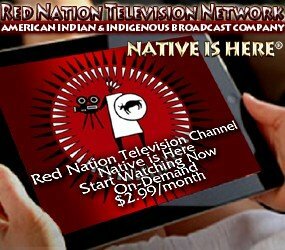 In 2013, RNCI Red Nation Awards Show made history in a televised broadcast reaching 19 million homes with our partnership with Comcast | NBC Universal and on Red Nation Television Channel – Native is Here to 10 million viewers in 37 countries, marking RNCI Red Nation Awards, the first American Indian Awards Show to televised and 2014 the first time an American Indian Awards Show was broadcast LIVE. Red Nation InternationalFilm Festival (RNIFF) programs include films, panel discussions, receptions, filmlabs, talent development, VIP parties, filmmakers lounge, awards show, native film market, Red is Green Carpet Events – Native Fashion with Social Action, all in alignment with the festivals mission. The Festival will close with RNCI Red Nation Awards on Friday, November 16, 2018, celebrating cinematic achievements in films, television, music and comedy on behalf of American Indian’s in media, social justice, and the arts. 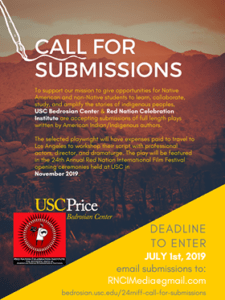 The Festival and Awards Show was born out of Red Nation Celebration Institute (RNCI), Red Nation is at the forefront … In Vision, Creativity, Leadership, Inspiration & Sustainability for American Indian & Indigenous Nations in New Media & the Arts, since 1995. In staying true to our Heritage, Culture, History, Tradition. The Festival & Awards Show is Home to the Native Documentary Voice™ and is the Premiere Showcase for Native Independent Films. * August 31. Submissions are NOW CLOSED for the 23rd RNCI Red Nation International Film Festival. * October 5. – Special Surprise announcement! * October 8, 15, 22 and 29 Every Monday in October RNCI & USC will release pre-recorded Podcasts on different Topics. * October 11. – Why We Wear RED Call to Action in partnership with RNIFF. * October 26. – Special Surprise announcement! * November 5-15. – 23rd RNCI Red Nation Int’l Film Festival. The Authentic Voice of American Indian & Indigenous Cinema. * November 16. – 23rd RNCI Red Nation Awards Ceremony. LIVE Telecast. “The Industry’s & Indian Country’s Biggest Night for American Indian & Indigenous Voices” Cementing Native image at the forefront of the industry, highlighting the very best American Indian & Indigenous contributions in film, television, comedy, music and the arts. September 17th. FULL Official Festival 2018 Schedule! TICKETS & VIP PASSES & PACKAGES – On Sale NOW. Click here to purchase Red Nation Film Festival Passes and Packages. INDIVIDUAL TICKETS – On Sale to general public October 1st. Click here to purchase Red Nation Film Festival Tickets. Still have questions? No problem. Check out our FAQ page or call us at 818.665.5753. TBA. Click here for directions, maps and accommodations. Volunteers and interns play a key role in making the Red Nation Film Festival a yearly success. To learn more, click here. NOW CLOSED! Thank you filmmakers! This year looks to be EPIC, over 200 film submissions. For more, view our submission page for a complete submission guidelines. Visit our About page: click here, Inside the Festival page click here and Other Events click here for a list of the Festival’s exciting programs, awards show and more. 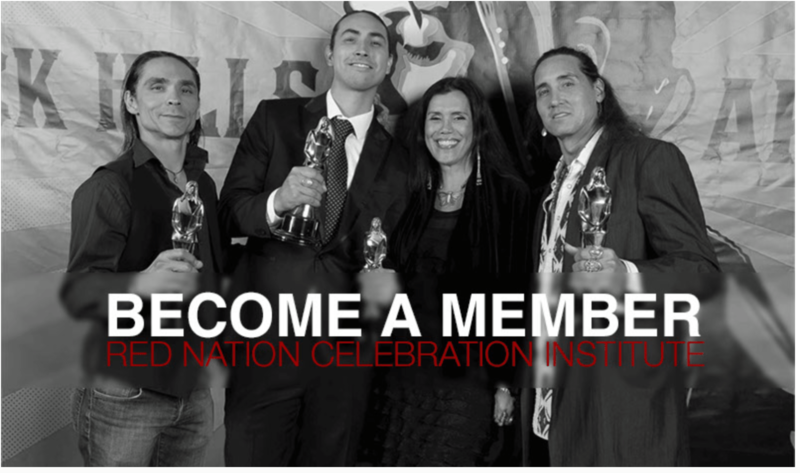 Red Nation International Film Festival & RNCI Red Nation Awards, founded by Award Winner Actor/Director/Executive Producer/Humanitarian Joanelle Romero (Apache/Navajo/Paiute/Cheyenne Nations/SpanishSephardicJew) and produced by American Indian nonprofit organization company Red Nation Celebration Institute. The Festival is solely operated by American Indian & Indigenous artists, filmmakers and respected leaders from within Indian Country.